Back in December, as I was still dealing with a crush of ANPRM-related reading, I mentioned that the journal Qualitative Sociology had published a special issue on "Ethics Beyond the IRB". I have finally found some time to read the intriguing essays it contains. The issue emerged from an October 2010 workshop at the University of Pittsburgh and features five articles as well as introductory and concluding essays. Kathleen M. Blee and Ashley Currier, "Ethics Beyond the IRB: An Introductory Essay," 401-413. Rachel L. Einwohner, "Ethical Considerations on the Use of Archived Testimonies in Holocaust Research: Beyond the IRB Exemption," 415-430. Bernadette Barton, "My Auto/Ethnographic Dilemma: Who Owns the Story? ", 431-445. Ashley Currier, "Representing Gender and Sexual Dissidence in Southern Africa," 463-481. Leila J. Rupp and Verta Taylor, "Going Back and Giving Back: The Ethics of Staying in the Field," 483-496. Melissa Swauger, "Afterword: The Ethics of Risk, Power, and Representation," 497-502. All of the contributors to the issue recognize that qualitative sociologists face serious ethical challenges as they go about their work, especially the challenge of being torn between their duty to report objective truths and the wish not to write ill of the people they study. Einwohner, borrowing from Janet Liebman Jacobs calles this the "double vision" of observer and participant. (417) Currier concurs, noting that "the injunction to report all findings may be untenable for qualitative researchers who study vulnerable populations. In some scenarios, another ethical principle may trump that of sincerity: that of the researcher’s responsibility to her research participants. Ethical and political concerns may motivate researchers to suppress certain observations they have made about research participants." (463) She suggests that researchers may want to adopt "an ethical principle of not 'air[ing] dirty...laundry in public,'" (466) but she notes that this conflicts with "researchers’ professional obligations [that] may require them to critique activists’ strategic priorities." (470). Currier resolves this tension with a rule of "When in Doubt, Leave It Out," though her list of episodes and statements she discarded from her findings is so long that I begin to wonder if her readers got a true picture of the phenomena she was seeking to describe. It's one thing not to air dirty laundy, another to suggest that people don't soil their clothes. A second, related dilemma concerns the blurring of roles when research subjects become friends and acquaintances, and when friends and acquaintances become research subjects. How much can one reveal about people you encounter in your daily life, the very people who teach you most about the world? What do you owe to people you have studied, once you have moved on to other projects? What do you do when "every single encounter I personally have with anyone or any text is potentially data"? (442) There are no easy answers. Barton refrains from quoting from an offensive essay by a student, but notes that "I feel some ownership of the incident and the essay." (436) But she recounts another story in the belief that "it is extremely unlikely" that Kentucky lesbians will enounter their descriptions in "a sociological or feminist academic journal." (441) Given the reach of the Internet, I'm not sure I share her faith. Rupp and Taylor describe a relationship with their informants that would seem to be as good as it gets. The researchers and participants became true friends, sharing confidences, life events, and even meager book royalties over the course of more than a dozen years. But even this relationship was not without suspicion and hurt feelings. Some of the ethical challenges reported by the authors strike me as a bit overblown. In particular, Einwohner frets about building a spreadsheet that required her to assign an ID number to Holocaust survivors, an act she found "reminiscent of similar records kept by the perpetrators of violence." (422) I think this may be an example of what Currier (following Laurel Richardson) calls "'analysis-paralysis,' a condition in which ethical worries grip researchers so much that they cannot move beyond an ethical impasse." (466) In this case, perhaps Einwohner might have taken comfort in reflecting that the Israeli government assigns its citizens identification numbers that must be used for all manner of transactions. Finally, Blee and Currier suggest that the punitive nature of the current IRB system could trap researchers who find themselves in ethically ambiguous situations. They offer the example of a researcher in Rwanda who showed compassion for one woman, which in turn offended another woman whose husband had been killed by the first. The researcher did her best to make amends, but I shudder to think how a case like this would be treated by an adverse-event reporting system. The "taken-for granted signed consent form" that "could jeopardize the safety of my research participants." (447-448). Of course, 45 CFR 46.117(c)(1) specifically anticipates such circumstances, and a better IRB might have pointed that out to González-López. Instead, she had to reinvent this particular wheel. 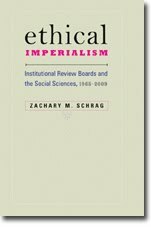 The IRB's power to "silence youth (as well as other populations socially constructed as vulnerable by the IRB) [which] may represent an ethical challenge and frustration for feminist qualitative researchers who are actually interested in investigating and exposing injustice, and advocating for populations vulnerable to multiple oppressions." (457) González-López offers the example of a young woman who had traveled three or four hours through Mexico City traffic to have a chance to talk with her. This case is a reminder that IRBs that imagine conversation about traumatic events to be risky in itself are likely to deny such people the chance to make their own decisions about whom to talk to. The IRB's failure to anticipate that an informant might sexually harass the researcher. (456) This is not the IRB's responsibility, but the IRB could have done a better job explaining its role to González-López. That sounds lovely, but how can deep understanding emerge in a climate of fear, acquiescence, and confrontation? It seems to me that only reform of federal and university policies can bring this change.